Before we tell you anything we must stress that this solution is being suggested by us as an alternate workaround in case you have issues with updating your Sony Ericsson Xperia Arc to the 2.3.4 Android OS version. 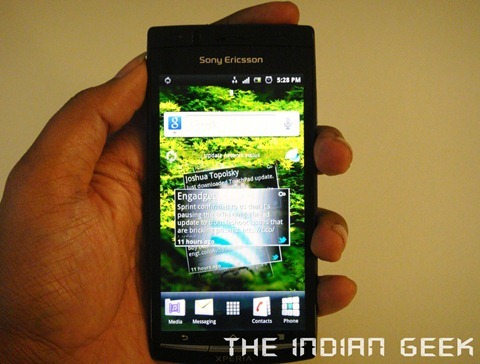 Sony Ericsson support provided a link to download an Update Service setup file, which then downloads the required Android OS update and installs it to the device using a PC via USB. Sony Ericsson support provided this to use with a Windows 7 64-bit PC, to update the unlocked Xperia Arc that is sold in India – we are not sure if this could be used for unlocked Xperia Arcs sold in other regions (or for systems running Operating Systems other than Windows 7 64-bit). Also, we have no clue if this Update Service software could be used for other Xperia devices. Please check with Sony Ericsson. And finally, as always, be wise in proceeding with this update. If you’re not sure of what you should be doing, you should either check with Sony Ericsson support or take assistance from a wiser individual. It also helps to have your Xperia Arc charged to more than 70% before starting the update. away. Flowers are like angels, they make you realize that life is all about different colors, and flag the colorful versatility of life itself. Visit www.rightflorist.com/Spain_Florist/Gifts_Flowers_spain.asp for details. recall the great time you spent together. Flowers are, in short, a miniature of your inner traits that you always wished to let your loved ones know. Visit www.flowersdeliverychennai.com for more information.